Notre Dame could take a decade to rebuild – and construction work is unlikely to start for at least 12 months, warned the man who helped restore gutted York Minster. 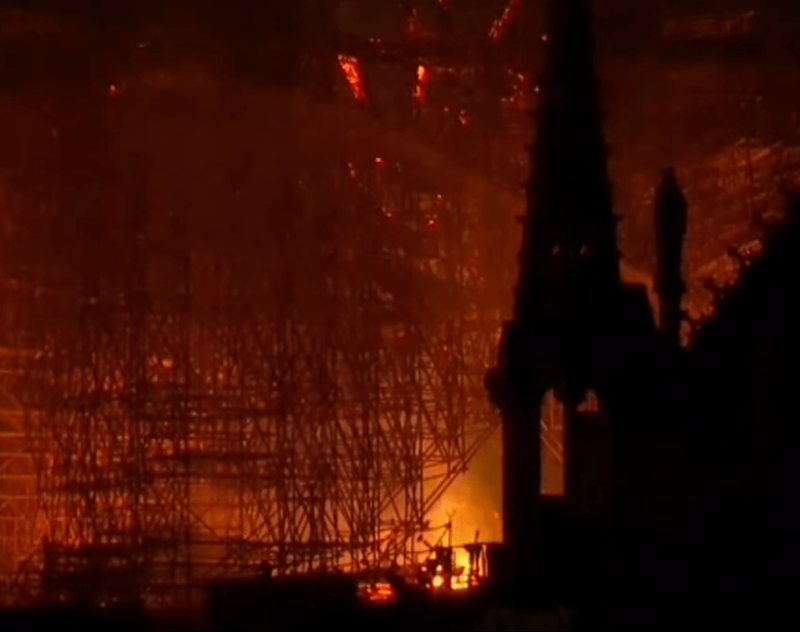 The entire wooden roof of the iconic Parisian church, a World Heritage site, was completely destroyed after being engulfed in flames last night. But experts say that the burnt out landmark, a World Heritage site, could remain untouched for at least a year while it is decided whether to keep the original oak structure – or replace it with steel. Geoff Brayshaw, 62, was one 12 joiners to rebuild York Minster after it was devastated by a fire in July 1984. It took four years and £4 million of donations to reconstruct the North Yorkshire Cathedral. He said: “Our volting underneath the roof was wooden, but Notre Dame is made out of stone – that’s the main difference. “So they will have to restore the stone instead of wood which could take some time. “If it is just the roof, then we are looking at five to six years but, to be honest, it is likely to take even longer – up to 10 years. “It’s safe to say Notre Dame will cost a lot more money than it cost us, it could possibly cost hundreds of millions. “It depends on how much help they get and how it is funded – we got donations and didn’t use any government money, but I suspect it will work differently there and they may get help from the government. “We also had an in-house work force; before the fire we had four joiners, but in the year afterwards this went up to 12. But the 62-year-old said it is unlikely any construction work will happen in the first year because bosses will be busy deciding what to do. He said: “The first thing they need to do is keep it water tight and then they can think about how to tackle it. “For ours, the first year was spent deciding which route to go down – we considered steel, concrete or keeping the same material which was oak – which is what we did. “They’ve got a lot of thinking to do and the first thing they need to do is get their heads together because the plan is the most important thing. “I doubt much will be done in the first year, they have to decide to either build it the same as before or go down an entirely different route such as a steel roof. “Metal work could be a quicker option but not necessarily the best. “In my opinion I think they should keep the oak. “If they stick to wood, they will have to source the timber, cut it and let it dry out, this all takes a lot of time. “I think the French will be looking into similar cases, including ours. “We now have compartments which means if there is a fire it won’t spread as quickly. Mr Brayshaw, who has worked as a joiner at York Minster for almost 50 years, was part of the workforce to rebuild the church after it was struck by lightning on July 9, 1984. He added: “Our fire started at 2am and I remember seeing the site when I came into work a couple of hours later. “The French must be so gutted, to think that hundreds of years of history and artwork has gone up in flames is gutting – I really feel for them. Clare Watson, chair of the National Federation of Bhilders Heritage Group, said: “We understand the anguish of seeing such an important landmark destroyed so quickly while being witnessed in real time across the world.